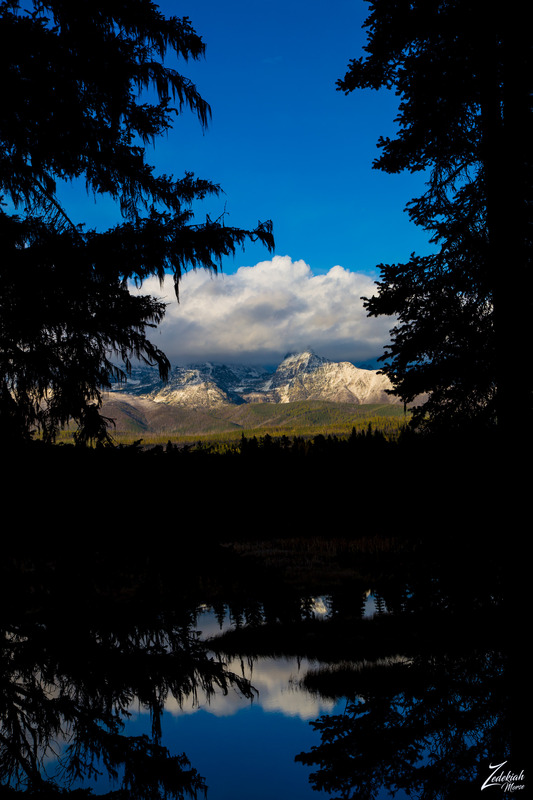 This is an interesting photograph of Numa Ridge, covered in the first layer of early snowfall, peeking out beneath the clouds and through the trees in this image I lensed while hiking and exploring the wilderness around Sullivan Meadow in northwestern Montana. Fall has come to the northern frontier, the forests and mountains are changing and beginning to shed their summers green. In the immediate foreground, a runoff tributary of the North Fork Flathead River reflects the clouds and treeline from the opposite shoreline. In the not so distant past, all of this land was home to many First Nations Tribes such as the Blackfeet, Crew, and Flathead. Blackfeet occupied the country to the east and the Flathead territory extended from the valley to the west. These two tribes were never very friendly or even congenial often fought ferocious battles in the valleys and mountains. This was due to a number of issues but primarily seemed to have been because the Flathead crossed Blackfoot territory to hunt Buffalo. Blackfeet had an abundance of buffalo because they primarily camped on the east side of the mountains where the buffalo herds grazed, there were no buffalo west of the Continental Divide, at least north of the state of Utah. Flatheads crossed the mountains to secure their buffalo while Blackfeet crossed the mountains to their west to hunt along the mountain streams, which was considered Flathead Territory. Then there were the Cree to the north.